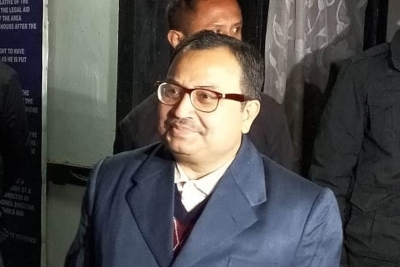 Shilong, Feb 12 (IANS) Former Trinamool Congress MP Kunal Ghosh, who was interrogated with Kolkata Police Commissioner Rajeev Kumar by the Central Bureau of Investigation (CBI) in Saradha and Rose Valley chit fund scams on Tuesday, claimed that many conspirators are still outside the purview of the probe. "I have tried to help the investigation since the beginning. This time also, I have tried my best to answer their questions. Many conspirators are still outside the purview of the probe and arrest," said Ghosh, who was arrested in November 2013 in connection with the two chit fund scams and later granted interim bail by the Calcutta High Court in 2016. Ghosh, who had earlier implicated former Trinamool Congress leader Mukul Roy and 12 others in the Saradha ponzi scam, said Kumar's interrogation was long overdue. "The complaints that were there for a long time were raised during the interrogation sessions and the good thing is Kumar had to listen to my complaints, which he earlier refused to," he said. "This (interrogation) should have happened long ago. It has been delayed a lot," he said. CBI interrogated Ghosh and Kumar together for several hours on Sunday and Monday, and recorded their statements. "They raised certain issues that they came across during the investigation and asked both of us to individually respond to that. They have recorded my statements and asked counter questions to Kumar on the basis of it," Ghosh said. The agency summoned Kumar for the fourth consecutive day on Tuesday for questioning.